As I get close to wrapping up this first volume of SkyHeart I thought I'd share the development history for this project. I remember having tons of story ideas and I'd keep forgetting them, so I decided to write them down as they came to mind so I'd never lose them. One of the first entries was for an idea about a planet that had been hollowed out and was now crumbling. I had no idea what to call it so "hollow planet" seemed to work for the time being. These first few entries were just about world building, not thinking of characters or stories just yet. I wanted to figure out what the parameters of this world was before delving into who my characters were. First entry for SkyHeart, then titled "Hollow Planet"
Not long after my initial journal entries I started sketching out ideas for the characters and the world they lived in. I believe this is the first drawing I ever did of Airth. 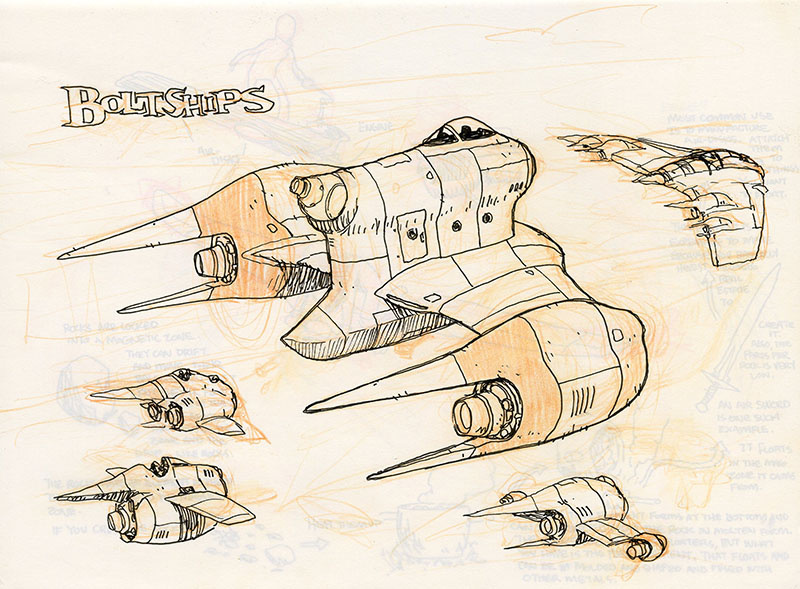 It's not dated, but it was in a stack of drawings from 2001 so it's from that year. 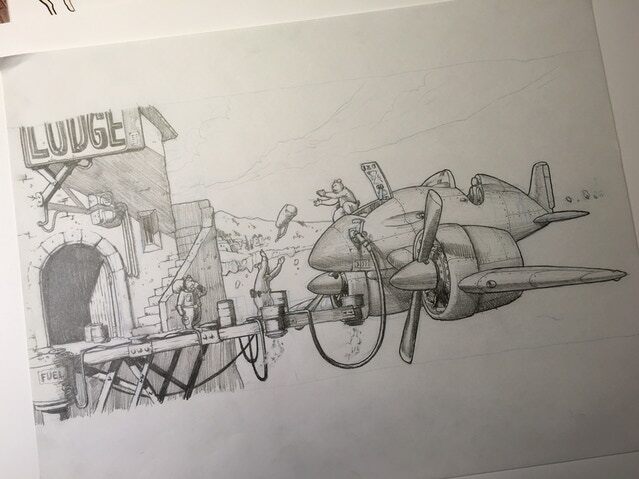 One of my first drawings for what would become SkyHeart. A group of crazy animals flying around in a gunship. It's been a lot of fun looking at these OLD drawings now. 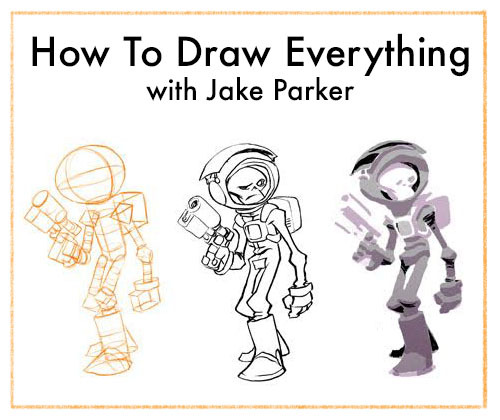 I wish the Jake that drew these 14 years ago could see what became of this little idea. 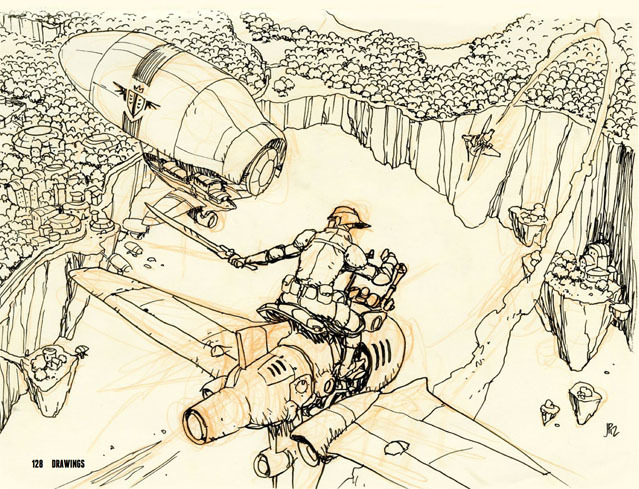 The idea simmered in my imagination for a year or so, until I was asked to be a part of an anthology book called FLIGHT. I thought this would be a great time to dig in to this world I was building, figure out some characters, and start crafting a story. As I was drawing these characters I started asking myself questions: What are their personalities? Why are they together? What were they riding in the sky for? I loved putting together this little story. It was only 14 pages, but it alluded to the much bigger world I was developing. I started fleshing out the world even more. And here's a few development designs for a side character in the story; a sky-elf. She would evolve to become a main character in SkyHeart, but I had no idea she would become that when I was designing her for this story. After writing more ideas about the story I decided I wasn't up to the task. It would be too hard for me to draw it and write it. I just wasn't good enough. I decided to shelve it for a few years as I focused on my Missile Mouse Graphic novels. 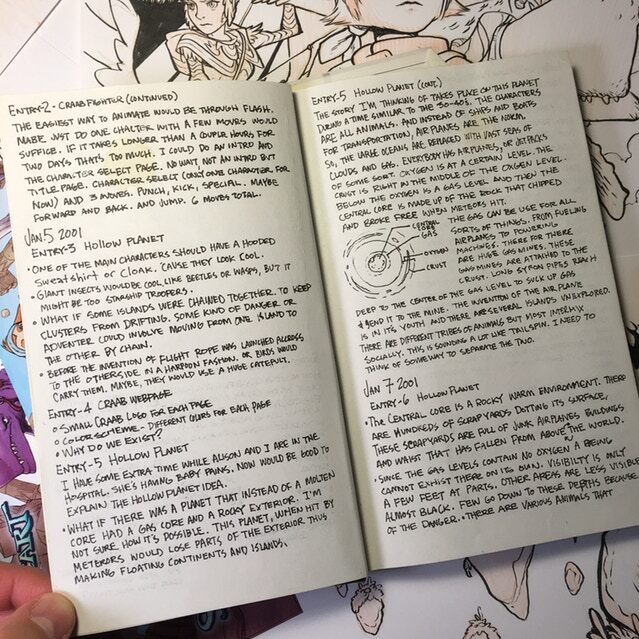 A couple years after MM, I launched a Kickstarter for a book that would collect all my short comic stories that I had drawn. It was called The Antler Boy and Other Stories. 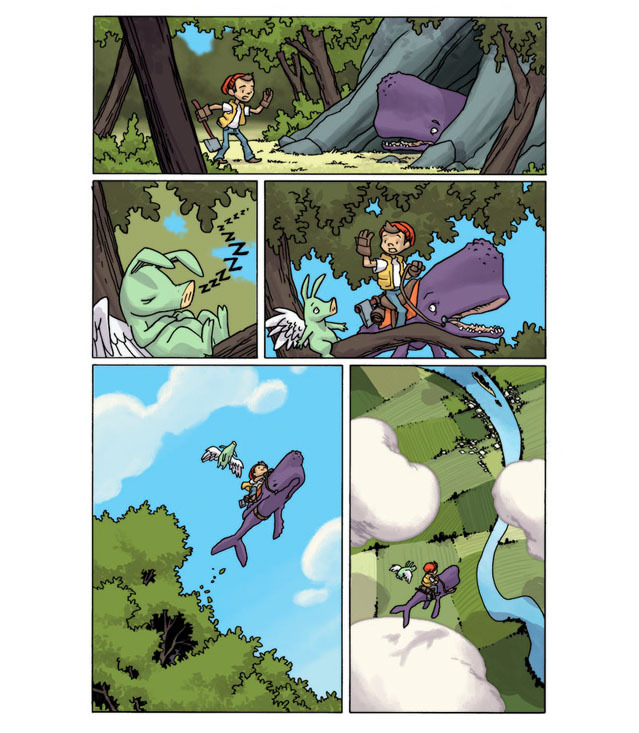 One of the stretch goals was for me to add a new Hugo Earhart story to it. Crafting this story rekindled my love for this world and I started to think about it a lot. I thought about how I had grown as a storyteller and as an artist. I thought about what I could do with this story and where I could take it. But I still didn't feel like I was ready to tackle an entire graphic novel. So I did what I do best: world build! It was this mix of fantasy and diesel-punk tech that made me feel like I was really onto something. But then again, the world and story overwhelmed me and I decided to shelve it again when I thought I'd be ready. For three years distracted myself with Lord Balderben, SkullChaser, Rocket Raccoon, and Little Bot. 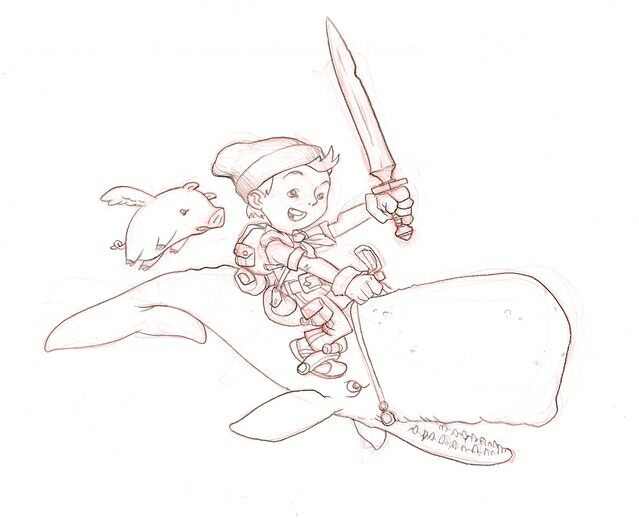 In those years I felt like I got much better at my craft, but I knew I would need a real kick in the pants to motivate me to overcome my fears and doubts with drawing SkyHeart. That kick in the pants came in the form of Kickstarter. That Kickstarter got me to finally put me in a place where I HAD to do SkyHeart whether I was ready or not. I talk all about how doing the book helped me overcome fear and doubt here. This post is already way too long, so I'll stop. 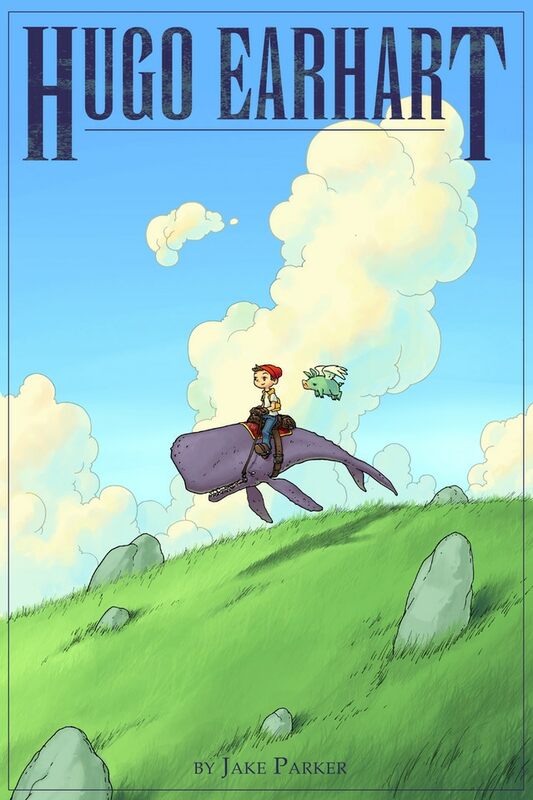 The SkyHeart Kickstarter had it's own development that I'll share in another post. Like, how Hugo went from being a boy to becoming a fox-like character named Wake. Thanks for reading this far. See you next week. 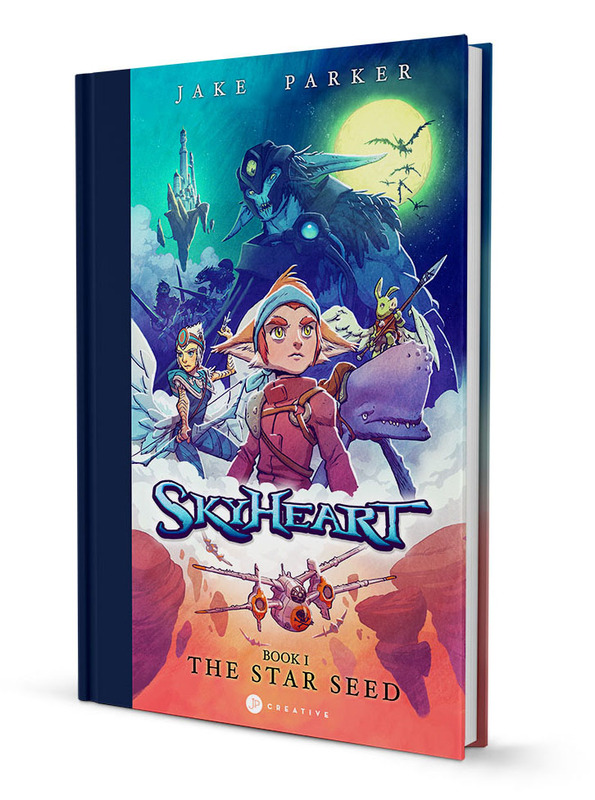 The SkyHeart book is coming soon! Sign up here to be notified when the pre-orders launch so you can get a copy. You'll also get production updates loaded with art, and info on where the story is going in the future.